ASUU leaders refused to comment on why they walked out of the meeting. 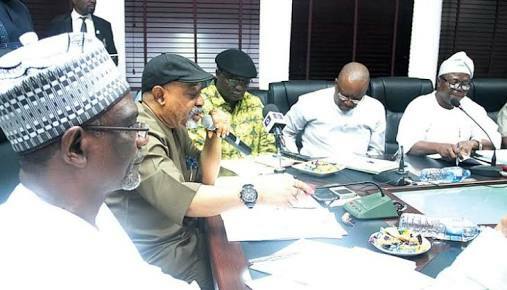 Speaking at the commencement of the meeting on Monday, Ngige expressed shock that the issue of short fall in salaries of university lecturers was still lingering. He however expressed hope the ongoing strike action by members of the Academic Staff Union of Universities will soon be resolved. The Minister said he expects the Office of the Accountant General of the Federation to brief the meeting on steps being taken to clear the shortfall. Ngige said that both parties will consider reports on all the outstanding issues with a view to reaching an understanding on the way forward. The University lecturers have been on strike since November 4th to protest government failure to implement its terms of settlement and address the problems facing public universities. Among the issues, which the Minister gave assurances on at the last meeting that he will be providing a feedback were the payments of salary shortfalls, Revitalization Fund and Academic Earned Allowances. On the issue of salary shortfall, the Minister said that he was surprised that the payment has lingered despite agreement reached over the matter since 2017. Speaking on the non-payment of salary shortfall, Ngige said: “There is nothing new about it except that this Ministry is surprised that the issue of salary shortfall is still lingering “. ASUU President Ogunyemi said lecturers were waiting anxiously to hear from the FG over the promises it made at the last meeting. He said that it is based on the response from government that the union will be able to decide on their next line of action.